Have you ever even touched an ASUS phone? I thought not. But two of the coolest Android smartphones at CES 2015 come courtesy of the Taiwanese computer company. The first one's called the ZenFone Zoom, and for good reason: the $400 jet black flagship is gunning for the lauded Nokia Lumia 1020, a.k.a. the best cameraphone we've ever laid eyes on. Like the Lumia 1020, it's got a big camera bulge on the back, but this time it's not for a ridiculous 38MP sensor. Instead, a more humble 13MP imager is mated to an honest-to-god 3x optical zoom lens—the first optical zoom ever seen on a cameraphone. While the bulge actually sticks out a full 11.95mm, a bit thicker even than the 10.4mm Lumia 1020, the 10-element f/2.7-4.8 lens does have optical image stablization, laser-guided autofocus, and a xenon flash to round out the package. Oh, and a 5MP f/2.0 selfie camera around front with an 88-degree field of view. There also appears to be a dedicated shutter button, and a manual shooting mode where you can adjust the shutter speed and ISO. It sounds like a relatively high-end smartphone in other ways as well, with a 5.5-inch 1080p IPS+ screen, 802.11ac Wi-Fi, and up to 128GB of storage, though ASUS isn't yet disclosing which processor is inside. 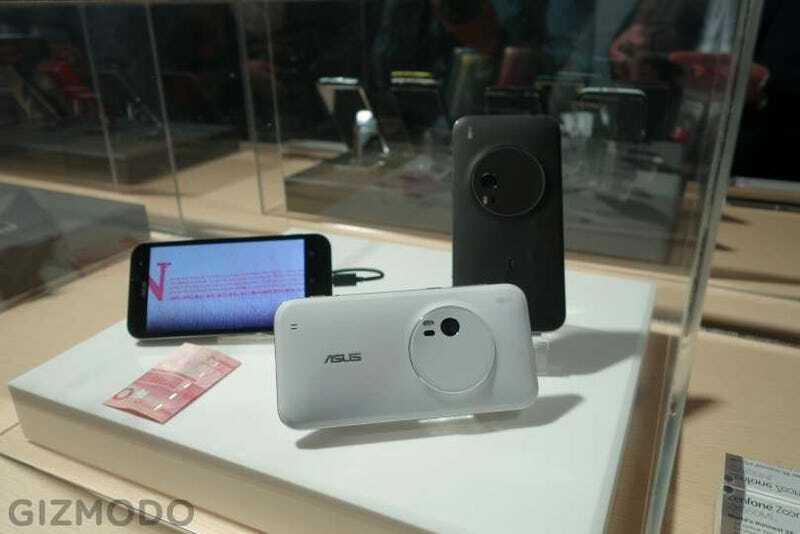 Also, though it runs Android 5.0 Lollipop, the Zoom comes with a new "fully-customizable" version of ASUS's Zen UI. The other problem is that we don't know if the ZenFone Zoom will ever come to the United States... or anywhere for that matter. The company's staying mum on availability. But that brings me to the company's second intriguing new handset: the ZenFone 2. This one's definitely coming to the United States, and for just $200 off-contract—which means it could give the OnePlus One and Moto G a run for their money as the Best Cheap Off-Contract Smartphones. I can't tell without testing, of course, but it sure sounds pretty good on paper: a fully laminated 5.5-inch 1080p IPS display at 403 pixels per inch, a 13MP camera, 2GB of RAM, 16GB of storage expandable via microSD, 802.11ac Wi-Fi, NFC, and a 3,000mAh battery, all in a slim-looking 10.9mm design that tapers to just 3.9mm thick at the sides. It comes with a quad-core 1.8GHz Intel Atom that hasn't yet been proven against the latest and greatest from Qualcomm, but it shouldn't be long before we know how the chips stack. Plus, it's got the 4G LTE connectivity that the Moto G still lacks. All for $200. Can't wait to give it a try.